Eureka! 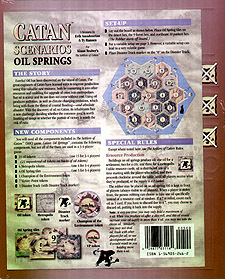 Oil has been discovered on the island of Catan. The great engineers of Catan have learned ways to improve production using this valuable new resource, both by converting it into other resources and enabling the upgrade of cities into metropolises. But oil is scarce and its use does not come without cost. Using oil produces pollution, as well as climate changing emissions, which bring with them the threat of coastal flooding - and absolute disaster. With the discovery of oil on Catan, its inhabitants face a new challenge: deciding whether the common good is worth limiting oil usage or whether the pursuit of victory is worth the risk of ruin.